The refusal to labor is the chief weapon of workers fighting the system; artists can use the same weapon. 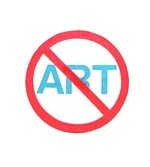 To bring down the art system it is necessary to call for years without art, a period of three years…when artists will not produce work, sell work, permit work to go on exhibitions, and refuse collaboration with any part of the publicity machinery of the art world. This total withdrawal of labor is the most extreme collective challenge that artists can make to the state. The years without art will see the collapse of many private galleries. Museums and cultural institutions handling contemporary art will be severely hit, suffer loss of funds, and will have to reduce their staff. National and local government institutions for the financing and administration of contemporary will be in serious trouble. Art magazines will fold. The international ramifications of the dealer/museum/publicity complex make for vulnerability; it is a system that is keyed to a continuous juggling of artists, finance, works and information–damage one part, and the effect is felt world-wide. said it all….and was almost completely ignored. Reinstatement of individual grants from the National Endowment for the Arts for artists, poets, and art critics. Allow artists to deduct from their taxable incomes the full market value of their own artworks when these artworks are donated to museums, as is now the case for collectors and other investors. Create a cabinet-level Secretary of the Arts. The forced resignation of all art collectors and real-estate developers from the Boards of nonprofit art museums and art spaces, on the grounds of conflict of interest and profiteering. Gustav Metzger: Untitled (Auto-Destructive Art), 1961. Acid on nylon. Metzger: Untitled. 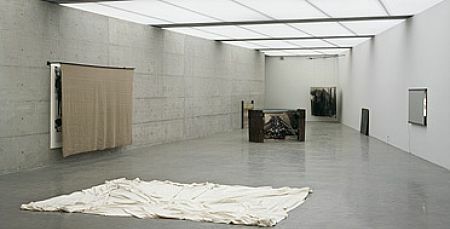 Recreation of above, 2006. As fate would have it, Artopia’s proprietor came across a remaindered copy of Gustav Metzger History History, Generali Foundation, Vienna (ed. Sabine Breitwieser) issued upon the occasion of Metzger’s retrospective in 2005 in Vienna. Born in Germany in 1926, young Gustav, accompanied by his brother, were transported to London in 1939 by the Refugee Children’s Movement and thus, unlike the rest of his family, escaped the Holocaust. 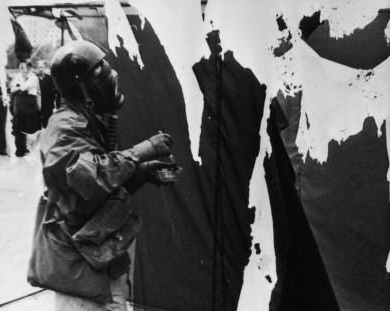 In the late ’50s he was both an anti-nuke activist and the founder of what was to be called Auto-Destructive Art. 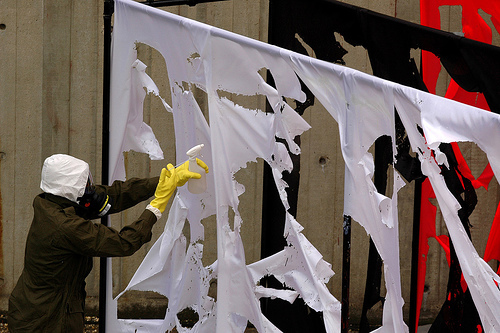 One manifestation of Auto-Destructive Art was his own creation of paintings by spraying acid on plastic sheets, causing them to disintegrate by the end of the performance. He was the instigator of the seminal Destruction in Art Symposium in London in 1966. Both Yoko Ono and Ralph Ortiz were participants. 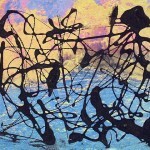 Metzger was the initiator of projected art that seeded rock concert light shows. More recently, now over eighty, he has systematically affixed pages from daily newspapers to gallery walls and also installed what he calls “Historic Photographs” – blowups of horrendous atrocity photos, displaying them behind false walls or behind or under fabric. 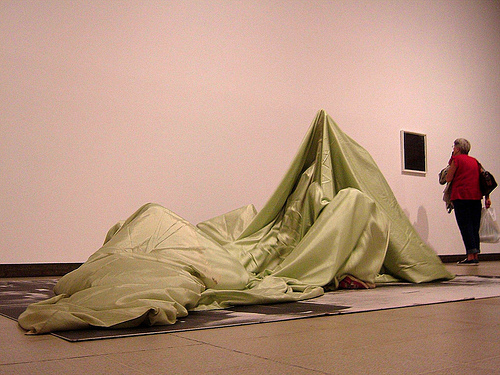 In one case, viewers were allowed to crawl under a canvas to experience the now defamiliarized image placed flat on the floor. Metzger: ‘History Photographs” (To Crawl Into – Anscluss, Vienna, March 1938), 2005, showing viewer looking at photo blow-up. 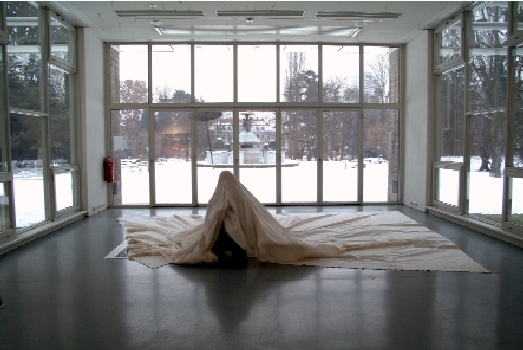 Another installation: Metzger: ‘History Photographs” (To Crawl Into – Anscluss, Vienna, March 1938), 2005, showing viewer looking at photo blow-up. In a severely reductive way (which is how we control true innovators), we only seem to know, if anything at all, that Metzger’s actions and theories inspired both John Latham’s chewing up and spitting out of Clement Greenberg’s Art and Culture and the guitar-smashing antics of Pete Townsend of The Who. Why has there not been a museum exhibition of Metzger’s work in New York City? Is his work too radical, too political? Could it be that because of the very nature of his art, there is too little to sell? It should also be noted that Punk/post-punk novelist artist Stewart Home — famous in some circles for dressing up as his drug addict/ fashion model mom–also initiated a three-year art strike in Metzger’s footsteps: 1990-1993. It was equally effective, and I am sure you noticed that the art world changed for the better after 1993. Now we have yet another art strike, but initiated anonymously by person or persons unknown. Maybe this strike will work. 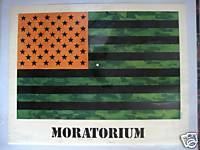 If you count as an art strike the one-day, anti-Viet-Nam war moratorium of October 5, 1969 — now apparently only remembered for Jasper Johns’ American flag print commissioned by his art dealer Leo Castelli, then this is Art Strike Four. Four strikes and you are out! What would be gained by a three-year Art Strike? Such an activity — rather, radical inactivity — would accomplish several things not mentioned by Metzger in his historic challenge issued by the ICA, London, in 1974, now quoted by this new effort at an Art Strike. As Metzger further stated so long ago, an art strike would cripple galleries and museums. Galleries, of course, could coast for one or two years on inventory, which is why the three-year moratorium is an absolute. An art strike is risky. It strikes fear in the hearts of artists as well as the public. But without risk, a political action just like an aesthetic action has no force. So what is at risk? One: It is not certain that the public will really miss contemporary art. Two: It is not certain that artists will really miss making art. Three: It is not certain that the collapse of the art system will result in the demise of the collector and the collector mentality; tulip bulbs or light bulbs or clown noses may become the next new collectible. Four: It is not certain that “artists” will find other things to do to keep themselves out of trouble. Sexual shenanigans, alcohol abuse, and dangerous drug use could escalate. Five: It is not certain that preparators, receptionists, art-handlers, framers, and all the cooks and waiters working in nearby restaurants and lunchrooms will ever again find gainful employment. Six: It is equally uncertain that critics, curators, and the like will be able to find other ways of making a living. It is certain that parents will no longer think of art as a safe career for their clean-cut spawn and will therefore force them to go to law school or study engineering. This will depopulate degree-granting venues and their compulsion to have everyone in the world earn increasingly dubious MFAs to prove that they are artists. It would also have the added effect of forcing artists and critics employed as teachers to find other, more socially productive, more intellectually challenging and culturally enriching employment. Will anyone make art if there is absolutely no chance of making money out of such diddling? How much fresh air can the art world stand? Once gainful employment is again the norm, will anyone have time for squeezing out art? Will envy and competition disappear? Will bitterness and commercialization dissolve? “Pictures Generation” at the Met Please scroll down. Oldenburg at the Whitney Please scroll down. Ernesto Neto at the Armory Please scroll down.